This SLS video outlines all scleral lens fitting basics including preliminary testing, insertion, removal, lens care, slit lamp basics, OCT measurements, and follow up care! Now you can pay your account on-line. What Can I Fill My Scleral Lenses With Now??? Need Help With Scleral Lens Evaluations? 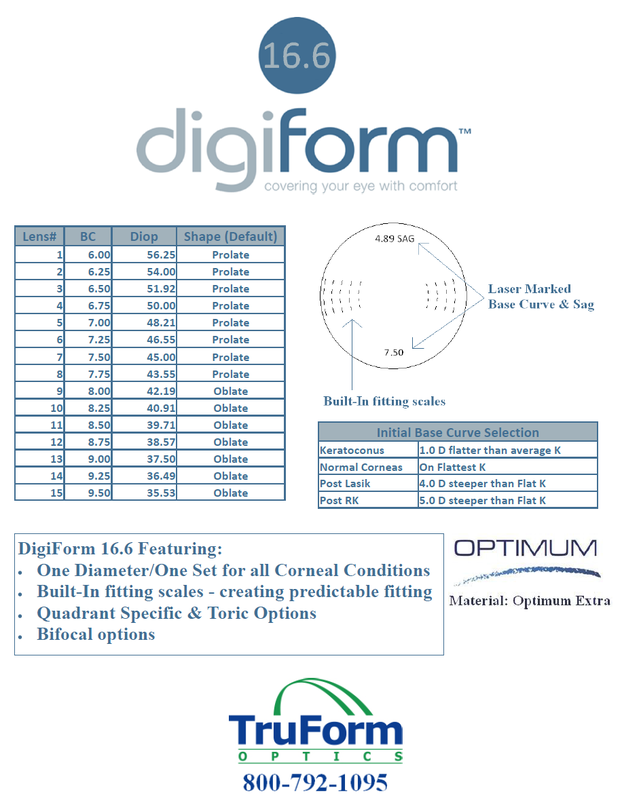 Check Out the New Scleral Lens Fit Scale From Ferris State!! At TruForm we take pride in every lens we design and manufacture. Our eight patents lead the industry in specialty designs for presbyopia, keratoconus and irregular corneas after surgery. We now offer our unique DigiForm Scleral(patent number US 7,862,176) lens designs as well. Our most recent patent for Quad® Technology is used to manufacture our proprietary QuadraKone keratoconus contact lens design. QuadraKone features a customized and symmetrical fit for keratoconus patients with asymmetric eyes allowing practitioners to fit irregular corneas by treating each of the four quadrants separately. Now available in Menicon Z material! This website is for eyecare practitioners. For patient information, please visit GP Contact Lenses. © Copyright 2007 TruForm Optics Inc. All Rights Reserved.